A team of scientists from the National University of Science and Technology "MISIS", the Moscow Technological University (MIREA) and the Pirogov Russian National Research Medical University has experimentally proved the effectiveness of the formerly suggested "light" method in oncotherapy. In a series of laboratory preclinical tests, the tumor growth stopped in 70% of mice, treated according to the innovative scheme. The results are presented in Pharmaceutics journal. Selective elimination of malignant cells (when the active ingredient targets the tumor, not the whole body) is a vital part of modern oncotherapy. If this elimination is of high quality, the "hit" becomes more precise and the drug toxicity decreases; the resource to fight the disease increases. "Photodynamic therapy is a cancer treatment method that uses a combination of special preparations - photosensitizers and light with waves of a certain length. Photosensitizers tend to accumulate in the tumor and when exposed to light with a certain wavelength contribute to the formation of a special form of oxygen, which destroys cancer cells. In addition to destroying cancer cells, photodynamic therapy destroys cancer in two other ways. First, photosensitizers can damage the blood vessels in the tumor, thus disrupting the flow of nutrients to it. Second, they can activate the immune system, causing it to attack cancer cells", - Mikhail Green, one of the authors, Sc.D. 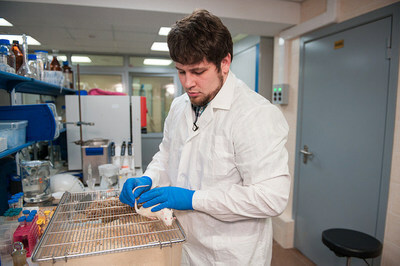 in Chemistry, Head of the Department of Chemistry and Bioactive Compounds, MIREA. Scientists have combined a magnetic nanoparticle (deliverer) with a molecule-photosensitizer, which kills cancer cells when affected by light. The resulting hybrid allows using MRI to track the movement in the bloodstream of molecules-"killers" and the level of their accumulation in the tissues in real time. "Even at the theoretical stage, we have suggested that the optimal time of exposure to light can be determined by the intensity of the signal on the MRI image and the data obtained after the introduction of the hybrid "magnetite + photosensitizer" is 60-100 minutes, - Maksim Abakumov, one of the coauthors, Head of NUST MISIS Laboratory "Biomedical Nanomaterials", - Next, we conducted a series of preclinical tests on three groups of mice for 21 days. The first group received radiation after 30 minutes after injection of the test drug, the second one - for 60-100 minutes, the third - after 3 hours or more. As a result, almost all mice from the second group demonstrated stop in tumor growth, which proved the correctness of the proposed hypothesis."